Forest Hill was once the beloved summer home of oil magnate John D. Rockefeller and his family. It is now part of the Rockefeller legacy in Cleveland. John D. Rockefeller, Jr. purchased the estate from his father in 1923 and, with New York architect Andrew J. Thomas, planned an upscale residential and commercial development featuring distinctive French Norman style architecture. Although the Great Depression forced Rockefeller to suspend operations, following World War II others were drawn to Forest Hill to build comfortable colonial and contemporary ranch homes on the remaining open land. Design principles of the Rockefeller-Thomas plan were extended to the later development and today Forest Hill is a rich tapestry of people, homes and gardens — a testimony to the quality upon which Rockefeller insisted. John Davison Rockefeller (1839-1937) was born in Richford, New York, and educated in the public schools of Cleveland, Ohio. He became a bookkeeper in Cleveland in 1855 at the age of 16. In 1862 he went into business with entrepreneur Henry Flagler and Samuel Andrews, the inventor of an inexpensive process for the refinement of crude petroleum. In 1870 their firm, Rockefeller, Andrews & Flagler, changed its name to the Standard Oil Company, often referred to as the Standard Oil Company of Ohio. Rockefeller, his brother William, Andrews and Flagler ran the business. In early 1872, Rockefeller helped form the South Improvement Company, an association that unified many oil refiners in Cleveland with the Standard Oil Company. Railroad companies awarded substantial rebates for members of the South Improvement Company because of the huge volume of cargo these companies shipped. This plan prevented price wars among railroad companies and forced smaller oil refiners that didn't join the association out of business. After three months of public outcry, the railroad companies and Rockefeller's group cancelled their arrangement. However, most of Rockefeller's competitors in Cleveland had already been forced to sell out to the Standard Oil Company. By 1878 Standard Oil also owned the major refineries in New York City, Pittsburgh and Philadelphia. In 1882 Rockefeller and his partners formed the first corporate trust, Standard Oil Trust, to merge many oil businesses throughout the United States into a single company. Rockefeller soon controlled 90 percent of the oil refineries in the country. Many heavily criticized Standard Oil for monopolizing the industry, and in 1892 the Ohio Supreme Court ordered the Standard Oil Company of Ohio to separate from the trust and become an independent business. As a result, the trust dissolved and Rockefeller and his associates reorganized and consolidated the Standard Oil conglomerate into 20 businesses. After the reorganization, Standard Oil Company of New Jersey, which was founded as part of the trust in 1882, became the largest Standard Oil corporation. In 1892 it was renamed Standard Oil Company (New Jersey), often referred to as Jersey Standard. Jersey Standard became the sole holding company for all of Standard Oil in 1899. However, in 1911 the Supreme Court of the United States ruled that Standard Oil had continued to act as a monopoly. The Court's antitrust ruling forced all of the Standard Oil companies to become independent businesses. That year Rockefeller, at age 72, retired as president of Standard Oil. Rockefeller and Laura Celestia Spelman (1839-1915), a teacher, were married in Cleveland in 1864. The Rockefellers had five children — Bessie, Alice, Alta, Edith and John. John D. Rockefeller, Jr. (1874-1960) joined his father's office in 1897 but soon focused his efforts on philanthropy rather than business. Together, he and his wife Abby Aldrich Rockefeller (1874-1948) expanded the Rockefeller philanthropic legacy in new directions, such as art, conservation and historic preservation. He was responsible for the restoration of Colonial Williamsburg in Virginia, and he donated the land along the East River in Manhattan for the site of the United Nations headquarters. His gifts of land to the American people included Acadia National Park in Maine, the Grand Teton National Park in Wyoming and the Cloisters in New York City. At its peak, Rockefeller's personal fortune was estimated at almost one billion dollars. The total amount of his philanthropic contributions was approximately $550 million; about 80 percent of these funds were given to four charitable organizations founded by Rockefeller: the Rockefeller Foundation; the General Education Board; the Rockefeller Institute for Medical Research (now Rockefeller University); and the Laura Spelman Rockefeller Memorial, established in 1918 and incorporated into the Rockefeller Foundation in 1929. In 1873, Rockefeller purchased Forest Hill, a tract of land bordering Euclid Avenue in East Cleveland. Initially, he treated the land as an investment and sold it to the Euclid Avenue Forest Hill Association in 1875 to be developed as a water-cure resort. However, when the venture failed, Rockefeller reacquired Forest Hill and completed the half finished sanitarium as a summer home for his family in 1878. Rockefeller did make one final attempt to generate income from Forest Hill by running the home as a private club for paying guests the first summer he stayed there with his family. This plan soon ended when guests expected to be entertained during their stays. The huge Victorian mansion was located on the crest of a knoll commanding sweeping views of the city of Cleveland and Lake Erie. Rockefeller gradually added to his country estate until it encompassed hundreds of acres stretching into Cleveland Heights. He improved the land with miles of winding gravel roads, bridle trails, foot paths, a race track for his horses and a nine-hole golf course. Bridges of stone quarried on the property were built to cross the deep ravines and brooks. The grounds were beautifully landscaped and included a lake for swimming and boating. Still, much of the estate remained shadowy woods and farmland. At the Homestead Rockefeller was able to enjoy time with his family and leave the cares of running his oil empire behind. And it was at Forest Hill that a young John, Jr. obtained the appreciation of nature that would later guide his charitable contributions. For more than a decade, the family divided their time between Forest Hill and a townhouse on Cleveland's Millionaires' Row on Euclid Avenue. Although Rockefeller established his legal residence in New York in 1884, he returned with his family to Cleveland each spring to live at Forest Hill until late fall. In October 1913, Rockefeller's wife, Laura, became ill and the Rockefellers were unable to return to New York until late February 1914. Rockefeller had been forced to stay in Cleveland past February first, known as tax listing day in Ohio. The Cuyahoga County tax commissioner seized upon this fact as an opportunity to increase revenues and attempted to levy a tax on all of Rockefeller's property wherever located, even though he paid the tax in New York. Although Mrs. Rockefeller recovered from her illness, she never again saw her beloved Forest Hill. Because of the tax dispute, which Rockefeller eventually won, the family did not return to Forest Hill in 1914. Mrs. Rockefeller died in the spring of 1915. Although Rockefeller outlived his wife by 22 years, he seldom visited Forest Hill after her death and the Homestead was destroyed by a fire in 1917. John D. Rockefeller died in 1937 at the age of 97. He and his wife are buried together not far from Forest Hill in Lakeview Cemetery, high on a hill with a view of the lake much like the one they enjoyed at the Homestead. In 1923 Rockefeller conveyed ownership of Forest Hill to his son for $2.8 million. Rockefeller, Jr. sold or donated portions of the estate for the Huron Road Hospital (1924), the Masonic Temple on Belmore Road (1924) and Kirk Junior High School (1929). And in 1938 he gifted 235 acres to the cities of East Cleveland and Cleveland Heights for the Forest Hill Park. Rockefeller specified that the park be planned and developed by noted Cleveland landscape architect Albert D. Taylor (1883-1951). However, for the tract east of Lee Boulevard, formerly farm and grazing land, Rockefeller had other plans. Rockefeller, Sr. owned large tracts of land in Cleveland Heights and East Cleveland and was involved in several residential projects. In 1906, Grant W. Deming had purchased property east of Coventry Road from Rockefeller and developed a residential allotment he named Forest Hill after Rockefeller's nearby estate. Grant's brother, Barton R. Deming, developed the Euclid Golf neighborhood beginning in 1913 on the site of a golf course that Rockefeller owned in Cleveland Heights. And as early as 1915, Rockefeller himself began a dialogue with the cities of East Cleveland and Cleveland Heights about developing the Rockefeller farm. But negotiations broke down over Monticello Boulevard. Cleveland Heights city officials wanted to extend the boulevard through the Rockefeller development to Lee Boulevard and include a streetcar, a plan to which Rockefeller objected. In 1921, Rockefeller had considered a joint residential venture with O. P. and M. J. Van Sweringen, the brothers responsible for so much of the successful development in nearby Shaker Heights and Cleveland's Terminal Tower. Although Rockefeller's plans with the Van Sweringens never came to fruition, his son established the community we now know as Forest Hill. In the mid 1920s, Rockefeller engaged New York architect Andrew J. Thomas (1875-1965) to plan an upscale residential and commercial development that would include 600 homes, apartments, a hotel, country club and inn, and business block. Self-educated, Thomas championed low income housing in New York City and popularized the garden apartment. He also designed numerous other housing projects for Rockefeller. The Forest Hill subdivision is believed to be his only work in Ohio. Using Garden City principles, the subdivision was planned as a harmonious village in an open park-like setting with gently curving streets and abundant trees. Thomas arranged the homes so that the backyards merged together to form a common expanse of greensward for the enjoyment of all the residents. For visual continuity, he designed all of the homes in the same French Norman style featuring steeply pitched slate or terracotta tile roofs, copper gutters and downspouts, wavy-edged red cedar siding, Ohio sandstone, and brick kilned in a color pallet specially created for the development. To further maintain the integrity of the neighborhood, the homes were completed with landscaping designed by the architect, including flowering crabapple trees, native American rhododendrons and Japanese azaleas. All of the homes were enclosed with a privet hedge. A 36 acre nursery was established onsite to allow Thomas "to build a charming village in its entirety...even to the placing of trees and shrubbery around each house." The homes are of nine different types, each with only minor architectural differences and most of them constructed in mirror image pairs, with each pair sharing a driveway leading to the basement level two-car garage hidden from view at the rear of the home. The first floor of each home has a living room, dining room and kitchen, with some also including a library/sun room. Three or four bedrooms with two or three full baths are found on the second floor. The homes included modern features such as steel casement windows, a recirculating heating system and grounded radio antenna. After four years of careful planning, construction began in 1929. Rockefeller's Abeyton Realty Corporation, named for his wife Abby, supervised the project. All of the infrastructure of broad winding roads, underground utilities (unusual for the time) and lampposts and street signs crowned with the Forest Hill dove were installed throughout the development. By 1930, 81 of the Rockefeller homes along Brewster Road and adjacent streets were complete and the Heights Rockefeller Building at the corner of Mayfield Road and Lee Boulevard was well underway. Architectural journals of the day praised the development and Thomas' contribution to standards of community planning. Unfortunately the Rockefeller homes sold poorly and the project was not a commercial success. Starting in 1932, the empty houses were rented and finally sold in an intensive sales campaign in 1936 and 1937 for nearly half the prices originally asked. Although the depression contributed to the failure of the development, some speculated that the homes, priced from $25,000 to $40,000, were too expensive for the Cleveland market. Potential buyers also may have wanted greater variety than the uniformity so carefully created by Thomas. The Van Sweringen's nearby development in Shaker Heights offered greater architectural diversity and more accessible public transportation. When Thomas' French Norman homes failed to sell, Rockefeller attempted to sell lots to other builders, primarily south of Monticello Boulevard. Charles O. Heydt, Rockefeller's trusted advisor and the president of Abeyton Realty, and James C. Jones, manager of the Forest Hill allotment, explored innovations in home building to attract attention to the development. For example, in 1936 the Arcy Corporation built five steel frame homes on Monticello Boulevard. Abeyton also offered Forest Hill residents various amenities, such as access to the Rockefeller estate and golf course, to spur sales. But by 1948 there were still 650 open lots. After struggling with the project for 20 years, in 1948 Rockefeller sold the undeveloped lots in Forest Hill for $200,000 to a real estate syndicate headed by Toledo businessman George A. Roose. The families formed by the returning GIs following World War II and the resulting baby boom helped fuel demand for housing, and by 1955 Roose had fewer than 100 unsold lots left in the subdivision. Roose developed the allotment block by block, beginning to the south and progressing northward. He did not build any homes on speculation as Rockefeller had, instead selling lots to other developers and individuals, leading to a mix of architectural styles, primarily colonial and ranch homes. However, the Rockefeller-Thomas plan was continued as the development expanded, as evidenced by attached garages, slate and tile roofs and mirror image home pairs in some cases. Post-war developers and designers proposed new solutions to meet the requirements of Rockefeller's original building restrictions and the contemporary lifestyles of new homeowners. Notable examples of architecture from this period include Toledo builder Donald J. Scholz's prefabricated California contemporary ranch homes along Lee Boulevard and the Frank Lloyd Wright inspired designs of Cleveland architect Albert J. Sgro. Upon his return to Toledo in 1956, Roose acquired Cedar Point, the Sandusky, Ohio amusement park with the intention of turning the 450 acre Lake Erie peninsula into a housing development. However, after a trip to California and a visit to Disneyland, he decided to redevelop the amusement park into the "Disneyland of the Midwest." John D. Rockefeller, Jr. instituted protective covenants that are included in the deeds of all homes in the Forest Hill development. The covenants are designed to protect and enhance property values and govern architectural standards, setback requirements, prohibited uses and minimum construction costs for Forest Hill homes. The deed provisions will remain in force for a century, expiring in 2029. Deed restrictions of this type were relatively common in the 1930s. What is unusual about Forest Hill is that the covenants are still enforced and retain their original vitality and purpose. Forest Hill Home Owners, Inc. is a nonprofit organization dedicated to preserving and promoting the integrity and legacy of the Forest Hill community. FHHO was founded in 1950 and has been empowered to administer Rockefeller's deed provisions to honor the original intent of his plan for Forest Hill to be a residential community whose high standards are guarded by well-chosen restrictions. All Forest Hill home owners are members of the organization and may participate in the election of FHHO's board of trustees who in turn are charged with representing the interests of the residents. The Rockefeller homes were placed on the National Register of Historic Places as the Forest Hill Historic District in 1986 upon the application of residents of Forest Hill and FHHO. The Heights Rockefeller Building was listed on the national register that same year. In 1987, FHHO formed the Forest Hill Historic Preservation Society to further promote and preserve the history of Forest Hill. In 1997, the FHHPS applied for and obtained national register status for Forest Hill Park. In 1999, the FHHPS decided it could stand on its own and separated from FHHO in order to serve the community as educators and historians of the Rockefeller legacy in Forest Hill. Rockefeller obtained his first job with Hewitt & Tuttle, a general wholesale firm on September 26, 1855. Throughout his life Rockefeller celebrated "Job Day" on September 26. 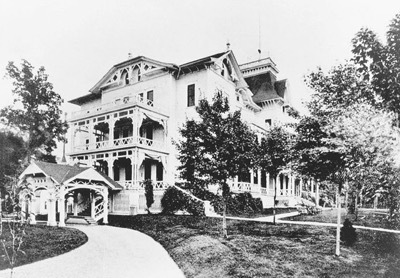 Rockefeller invested in the water-cure resort as well as the Lake View & Collamer Railroad, a steamline that would have provided rail access to the sanitarium. Rockefeller continued to acquire land up to 1913. His son purchased several additional small parcels, mainly along Lee Road, in 1925. "In the loss of Forest Hill," Rockefeller, Jr. wrote to his father, "I feel as though we had all lost a very dear and lifelong friend." Arson by two disgruntled former employees was suspected, but not confirmed. The "garden city" was first introduced by Sir Ebenezer Howard (1850-1928) in his book Garden Cities of To-morrow. Howard advocated pre-planned communities with nearby parks and ample green space. The King Standard street lights were replaced in 1975 and sold to the public. Fourteen of them were installed at the Beachcliff Market Square complex in Rocky River, Ohio. Although many early deed provisions of this type also included racial or religious restrictions, the Forest Hill covenants did not include these restrictions.